Always check the labels for the correct application; wood is treated with different loadings of preservative for different applications. Labels will designate Above Ground, Ground Contact or Ground Contact Heavy Duty applications, which refer to the intended use. Check out the Homeowners/Literature & Resources section of www.WolmanizedWoodU.com to learn more. 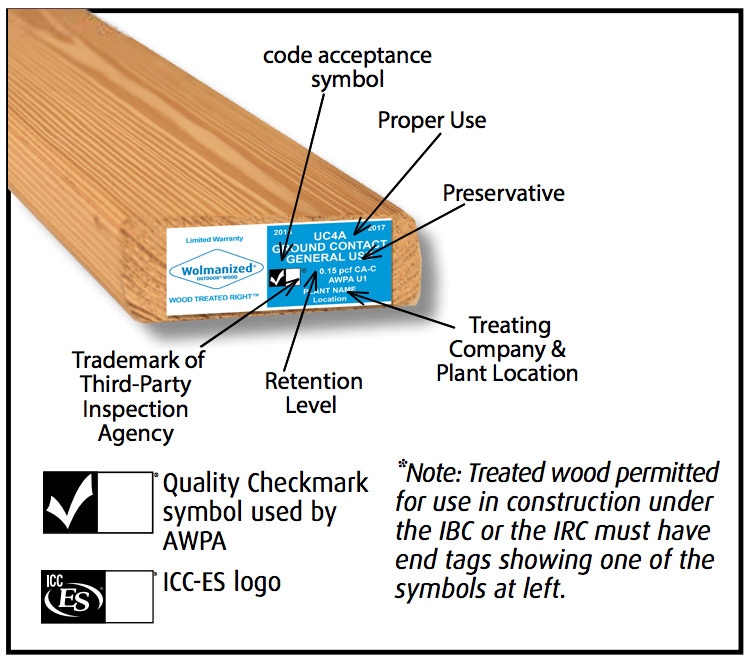 Reference to either AWPA U1 or ICC-ES ESR 1721 or ESR 1477 will indicate the product has been produced to accepted requirements and inspected. Note: For multi-level structures or screened porches with roofs, posts may be required to be treated to AWPA UC4B — Ground Contact Heavy Duty. Check local building code during permit process before construction. Separate deck boards as follows to allow for expansion and contraction. If heavy and wet, separate boards no more than 1/16” as some shrinkage will occur. If light and dry, separate boards about 1/4” to allow for swelling. Shorter spans between joists will help to minimize warping and twisting of deck boards as they dry. Also, avoid designs with long cantilevers unsecured at one end; check with your local building code department on maximum cantilever allowed. Lumber wider than six inches should not be used as a flat surface. Wide, flat boards are subject to ponding of rainwater, which can lead to cupping problems. Place boards bark side up. This side will be more likely to have treated sapwood on the exposed face. For Above-Ground treated wood, make sure there is good under-deck ventilation, allowing airflow around the entire deck. All Above-Ground treated members must be off the ground and free of leaves or other debris. Proper flashing or spacers should be used between all adjacent structures and the deck. 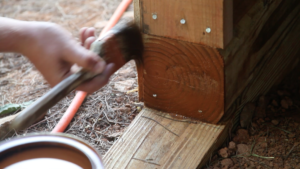 Cover upper ends of posts with post caps or cut them at angles to shed water. Before capping or after cutting, apply topical preservative solution to ends. If a board is bowed, install it with the crown up. Gravity and the weight of people and furniture will flatten it. If a board has a slight bend to it, it sometimes can be straightened as it is nailed in place. Use two nails across a 2 x 4 and three across a 2 x 6. Drive nails at a slight angle toward each other. 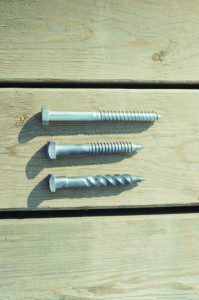 Use 3 1/4’’ long nails on nominal decking and 3” nails for 5/4” decking. Check fastener boxes to make sure you are buying fasteners that meet standards. Fasteners should be hot-dipped galvanized meeting ASTM A 153 or equally protected material. Connectors should be made from galvanized steel sheet conforming to ASTM A 653 class G185. Fasteners not meeting or exceeding these requirements could result in premature failures of fasteners and degradation of treated wood. Aluminum flashing (3015 or similar alloy) may be used in contact with micronized copper azole treated wood in interior or exterior, above ground applications that are damp or intermittently wet. For dissolved copper azole preservative or whenever treated wood is subject to immersion or frequent or prolonged wetting, factory coated aluminum or an insulating moisture-resistant barrier should be used between the treated wood and the aluminum. See the end tag for type of treatment (CA-C indicates dissolved copper azole and mCA-C indicates micronized copper azole). To reduce splitting, especially near the ends of boards, drill a pilot hole about three quarters the diameter of the nail. For dense or brittle wood, grind sharpness from nails or blunt the points by striking them carefully with a hammer. Blunt nails cut through; sharp ones pry apart. Liberally coat all cut ends, holes, or other intrusions into the wood with a suitable wood preservative product containing a minimum of 0.675% copper as oxine copper (copper-8 or copper-8-quinolinolate) or 1% copper as copper naphthenate. (One such product is Outlast® Q8 Log Oil. See www.chemtch.com for information and to order). Orient supporting posts so original factory treated ends are in ground contact. Trim the top ends as needed and cover them with post caps or cut at angles to shed water and treat with a brush-on preservative. No maintenance is needed to renew resistance to fungi and termites. Wolmanized® Outdoor® Wood Products have a limited warranty against these organisms. However, protection is required to maintain the wood’s appearance against weather. 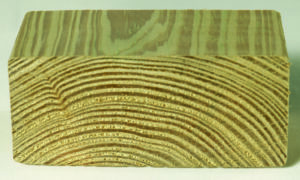 Sun and rain cycles cause stresses in lumber and result in swelling, shrinking, warping, and cracking. To help protect your project against moisture damage, apply an effective brand of surface water repellent as soon as your outdoor wood project is finished or, for large projects, as sections are completed. Water repellent should be applied every year or two. To revitalize a dingy appearance caused by dirt and mildew, use deck brightener to clean the outdoor wood. Apply an end-cut solution, containing a minimum of 0.675% copper as oxine copper (copper-8 or copper-8-quinolinolate), 1% copper as copper naphthenate, or 2% zinc as zinc naphthenate, to all cut ends and drill holes. While every attempt has been made to ensure the accuracy and reliability of the information in this document, Lonza makes no warranty, either expressed or implied, to that effect and will not be responsible for reliance on this information. The property owner / contractor should make his own determination and satisfy himself that the information and recommendations given by Lonza are suitable for his intended purpose and in compliance with local building codes and industry practices.